The audio and voice technology solutions provider Conexant has announced a collaboration with Baidu to release development kits and reference designs for device makers to develop far-field voice-enabled artificial intelligent (AI) devices running on Baidu’s DuerOS platform. DuerOS is a conversation-based AI system that already supports access to a voice-activated digital assistant for mobile phones, TVs, speakers, and other devices. The collaboration is aimed at helping developers and device-makers integrate DuerOS into their own products, establishing a high-performance standard for AI devices to come. Conexant’s far-field voice input processors focus on the user’s voice and remove echoes and noise from the audio signal to provide the DuerOS cloud AI platform clear voice requests for speech recognition processing. Conexant’s market-proven voice processing provides a consistently accurate AI experience. 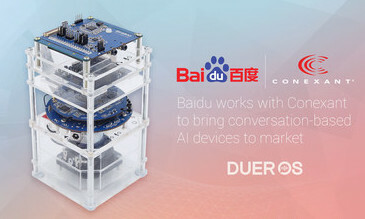 “Voice interface is a critical part of DuerOS and we are committed to working closely with Conexant to quickly grow the DuerOS ecosystem by offering product developers a solution to help them quickly fulfill consumer demand for top-performing AI-infused devices,” said Kun Jing, general manager of Baidu Duer business unit. Global ad spend will rise 2.8% to more than half a trillion dollars in 2013, driven by continued adoption of digital services and ..